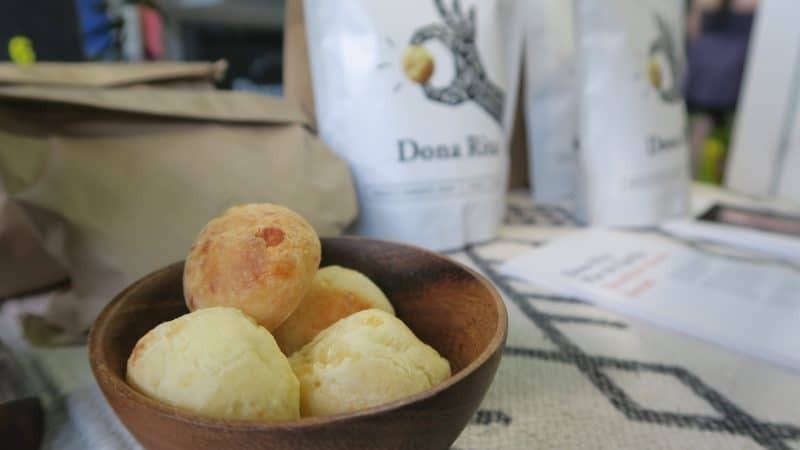 I’m a big fan of cassava flour and these gluten free, Brazilian cheese balls from Dona Rita were one of my highlights of the Allergy and Free From Show this year. I loved how beautifully-decorated their stand was too! I loved that the whole family got involved with the stand and they were so lovely! With a crunchy, crusty outside and a deliciously-fluffy inside, I could have eaten a LOT of these. 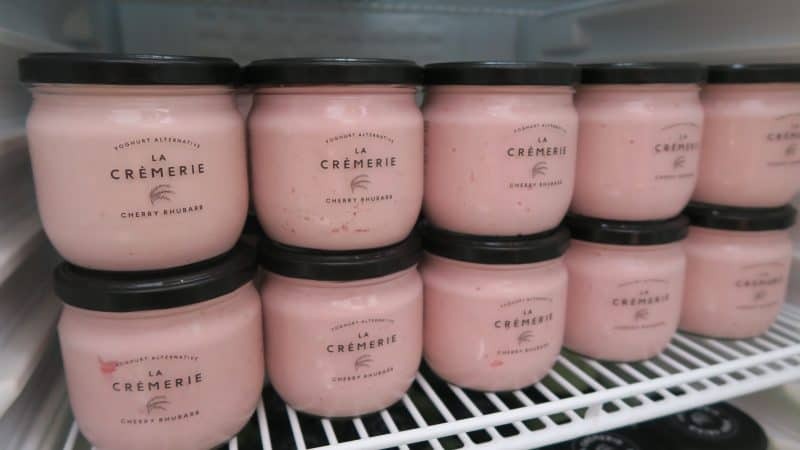 There were several things I loved about these rice yoghurts from La Crèmarie. Number one, they are yoghurts – made from rice! And you would never even guess they were dairy free. Number two, the packaging is so classy and beautiful, they feel like a real treat. And number three, they have a basil flavoured yoghurt. And while I would never have gone for it, it was actually incredible. I can just imagine how delicious it would be with fresh strawberries on a sunny day – heaven! 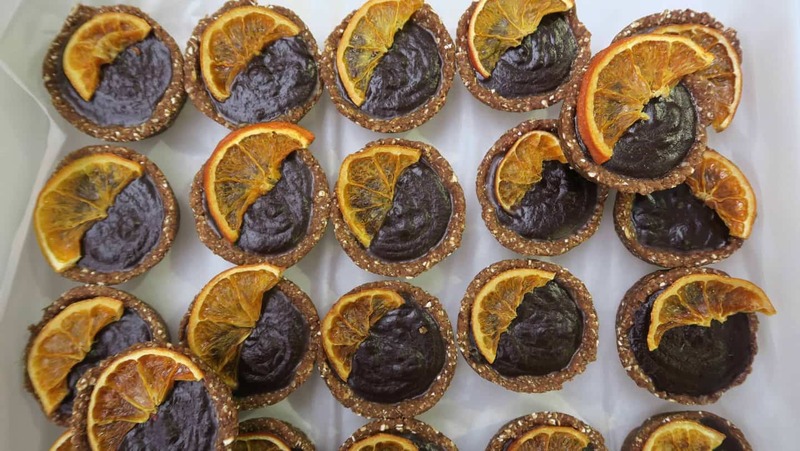 Can we please take a moment to appreciate how BEAUTIFUL these raw tarts are from Liberty Loves? They are gluten free, dairy free, egg free and vegan, and they look so gorgeous I almost didn’t want to eat them! There were all sorts of flavours but the chocolate orange ones looks so lovely. I tried the espresso ones and they were delicious. They are all free from refined sugar and made with agave. I thought they made a nice change to abundance of gluten free cake and pastry. 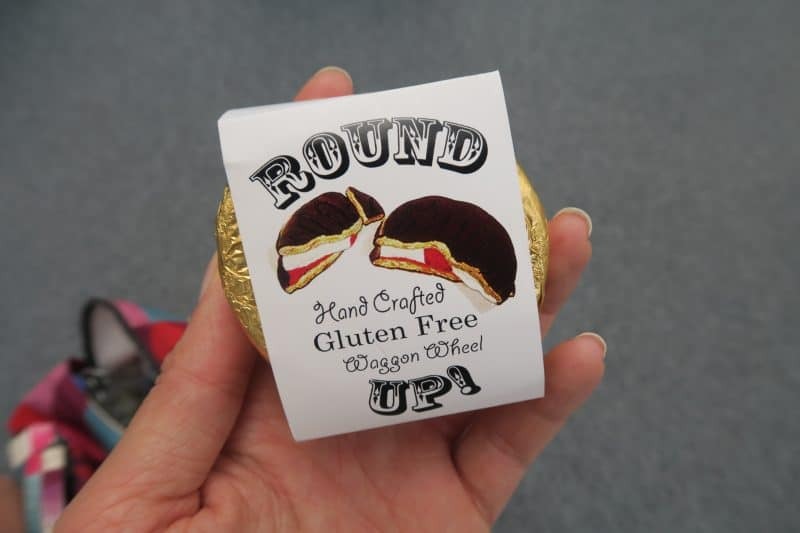 I’ve wanted to try these gluten free Waggon Wheels from Ananadas since I saw people posting about them at last year’s Allergy and Free From Show. And they didn’t disappoint at all. A thick slab of fluffy vegan marshmallow, sandwiched between two thick gluten free biscuits with a great dollop of jam in the centre. All sealed with a drizzle of chocolate, this was absolutely amazing and a real nostalgic blast from the school-lunchbox, pre-coeliac past! 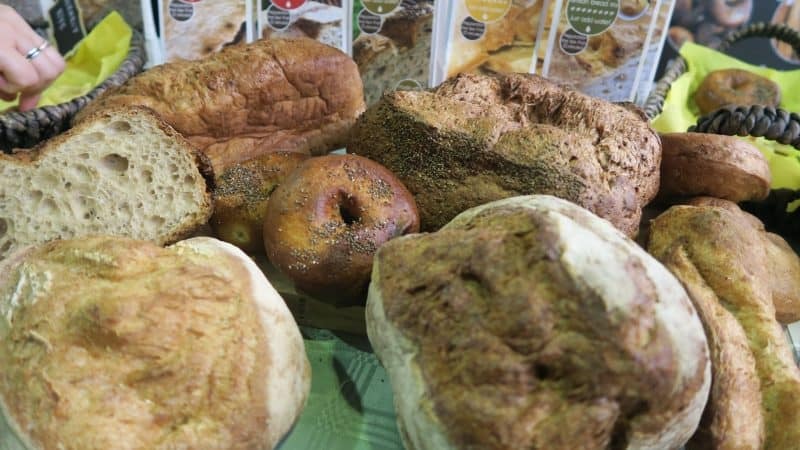 I had to do a double-take at Rana’s Artisan Bakery stand, because the bread on display looked so…NORMAL! Just look at those loaves! I hadn’t heard of this brand before I saw them at the Allergy and Free From Show but I was really impressed. The tasters were all delicious and my favourite was the Nearly Rye sourdough bread which had an amazing burst of fennel flavours. A lovely brand with lovely packaging and a lovely lady behind it. Anything coated with gluten free batter and deep fried is bound to go down well in a room full of coeliacs! 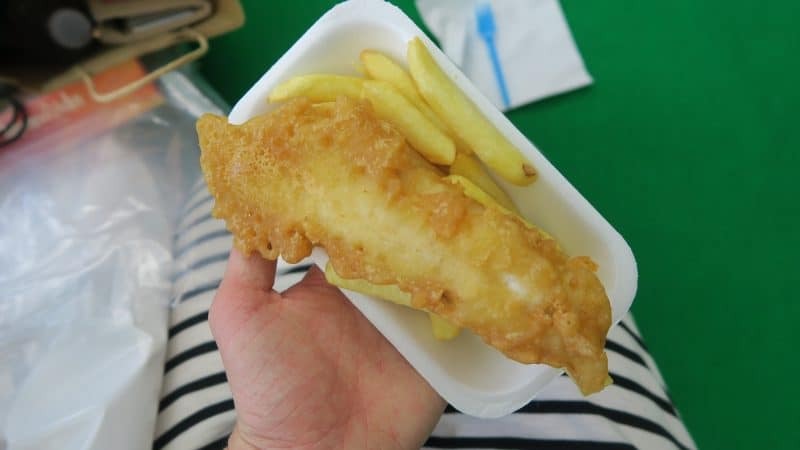 Fried treats like fish and chips are normally always a minefield when it comes to cross-contamination, so being able to enjoy these gluten free fish and chips from Middleton Foods was a real treat. The batter was crispy and delicious and it was a bit of fun standing and watching them fry up the food too. Looking forward to trying the free gluten free batter mix I got with my lunch! I stopped to talk to Jenna at Forced To Be Fussy and loved the look of her gluten free mixes. Her rocky road slices were delicious and packed full of lots of marshmallows – just how they should be! I really loved the idea of these mixes and it means you can have fun as a family conjuring up some yummy gluten free treats, without the hassle of trying to figure out which recipe to follow. WOW. That is all I have to say about this brand. Just wow! 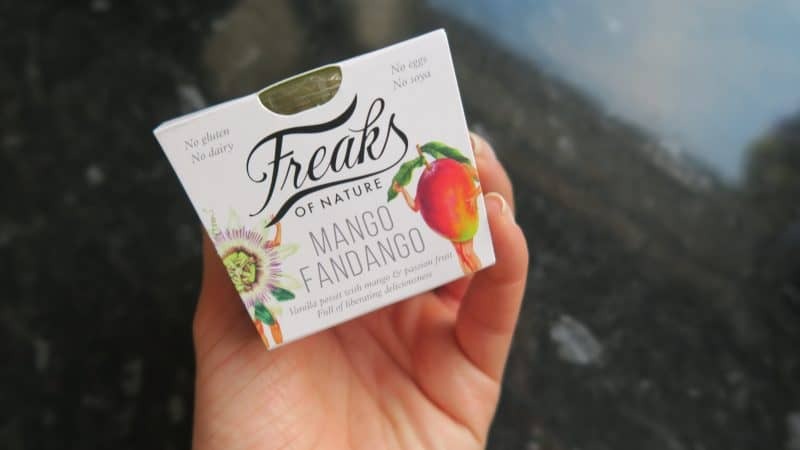 These gluten, dairy and egg free, vegan desserts from Freaks of Nature are insane! They are so indulgent and rich and delicious but you’d never even know they were free from so many allergens. They are made with cashew cream and honestly, my cousin and I just demolished all three flavours in one sitting in our pyjamas just before I wrote this! Definitely one of my show highlights – and I even got a free t-shirt! More Allergy and Free From Show highlights coming! 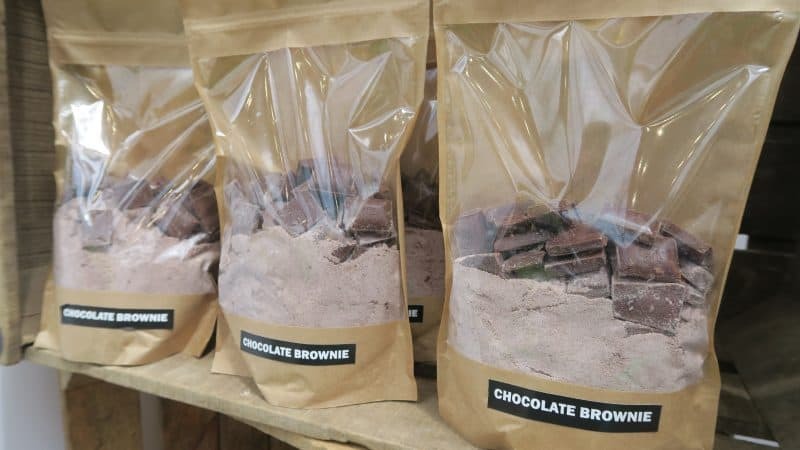 I will be posting a full review and video from my experience at the Allergy and Free From Show, as well as my full haul – and trust me, there is a LOT of food currently sat next to me!! I have so many amazing treats to try and I am so grateful to all of the brands who offered so kindly to give me samples of their precious stock! I can’t wait to share all of my gluten free finds with you! Allergy and Free From Show highlights: Pin it for later! Did you go to the Allergy and Free From Show in London this year? What did you think? And what was your favourite find of the weekend below? I’d love to know if there are any amazing brands I missed! Next Post The Allergy and Free From Show 2017: My complete gluten free haul! Blimey luv, you didn’t hang about, you did all the things I didn’t do haha…maybe I sat in that massage chair for toooo long! Can’t wait to see the video….wonder what else I missed hahaha!